Can a Caiman Alligator Be a Good Pet? Caimans might be smaller than their alligator and crocodile relatives, but they don’t make much better pets. There are a host of practical, safety, conservation and animal welfare reasons not to adopt a caiman unless you are running a reptile rescue sanctuary with excellent facilities and have some expertise. Caimans are crocodilians closely related to alligators. In fact, the main difference between caimans and alligators is not so much scientific classification as the fact that most caimans are a bit smaller. They all belong to the family Alligatoridae, in which there are two species of alligators and six different species of caiman. All the caimans are native to the Americas, primarily South America, although the range of one species, the spectacled caiman, extends into Central America. Caimans might be small but they are not that small. The dwarf of the family, appropriately called Cuvier’s dwarf caiman, can reach a length of 5 feet, while the largest, the black caiman, actually is larger than alligators. Adult male black caimans grow to 13 feet long and the Crocodile Specialist Group reports that some individuals might reach as much as 19 feet. No caiman is going to fit comfortably into a tank in your living room. Zoos and wildlife parks usually have the facilities required to keep a caiman. Most individual reptile enthusiasts do not. Caimans require a large, secure enclosure with a substantial water area. If you have seen crocodiles or alligators at a well-managed zoo, their accommodation should give you an idea of the space and housing required for caimans. Temperature is another consideration -- caimans are adapted to warm habitats and would not do well outside in a cooler climate. Providing a large enough, heated enclosure inside is an expensive business. 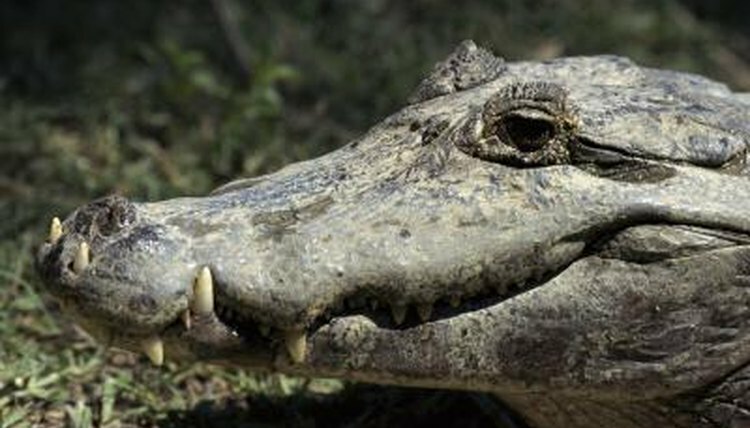 Diet, on the other hand, is not particularly specialized; most caimans readily eat a variety of meats and fish, and don’t require live prey. Captive individuals may need a calcium supplement, especially if they get a lot of lean meat, rather than pieces complete with fur or feathers and bones. It might be difficult for a caiman to kill a full-grown human, but they can still inflict terrible wounds. Even the smallest caiman has a fearsome bite and these animals don’t usually bond closely with humans. They are not hands-on pets and you need some expertise even for the minimal necessary handling and feeding. For obvious reasons, no householder with small children should consider adopting a caiman. The laws on keeping caimans differ by state. In many states, you will need a permit to keep one, as they are classed as dangerous animals. Other states currently have little or no legislation on these reptiles, but that might well change in the future. How easy or otherwise it is to get a caiman permit varies. Even if you are in a position to provide a good home for a caiman, it might not be legal for you to do so. It is imperative to check the legislation in your area beforehand. While caimans, or any other crocodilians, do not make good pets, there are some sizable lizards that can. Bear in mind, however, that any reptile is a long-term and often expensive commitment, not a creature to be acquired on impulse. In the case of the larger lizards, you will need a huge tank. If you are committed enough to want to adopt a big lizard, some of the species available in the pet trade include the Argentine black and white tegu, iguanas and monitor lizards. Their needs are all different and most of them can and do inflict painful bites, so always spend time researching the species you are interested in before making a decision. Another option is a non-venomous snake, such as a python. Always adopt captive-bred reptiles. Even better, adopt ones from an animal sanctuary. If you have the passion and space for a large lizard, consider rescuing one of those languishing in a sanctuary because his original owners lost interest or couldn’t cope.